I'm not the greatest when it comes to keeping plants alive. I blame it on the fact that I give too much love. Most of my plants die from over-watering in my attempt to keep them happy. Yet I've been doing surprisingly well with the newest plant additions to our home and I can already tell they've really lifted the mood. So if you're nervous about having plants and trying to keep them alive, here are five reasons you should add more plants to your living space. 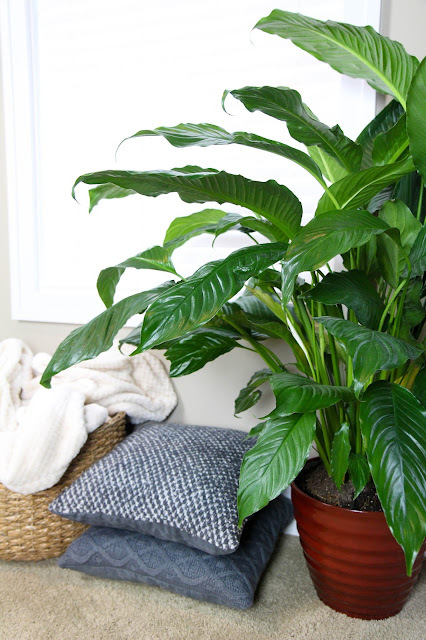 Plants naturally have a way of brightening up a living space. Winters in Michigan are brutal and soul sucking, but having a few plants here and there has made a huge difference in our mood. Plants make for excellent decor. I've been working on putting together our living room for a couple of months now and a big plant has done an amazing job adding a new element to the space. Living things are an excellent way to add more organic vibes to a room. Not all plants are high maintenance. There are tons of easy to take care of options if you don't have a green thumb. Terrible at remembering to water plants? Get succulents that barely need to be watered. Don't have a lot of natural light? There are plants for that. There's a plant for everyone. Oddly enough, plants give off the vibe that you're put together. When I lived in those run-down apartments in college there wasn't a plant to be seen. Established people have plants. Seriously. The next time you stop by a friend's house who is still in college or still trying to get their life together, it's likely they don't have a plant. Or if they do, it's probably dead. Above all, taking care of something feels good. No one ever looks at a plant and gets angry. Taking care of a living thing feels good and gives purpose. I'm already thinking about what plants I want to put outside our house when spring hits. I can't wait to get a little dirt on my hands and bring life to the outside of our house. Because it feels good. So go out and buy that little plant. Read the instructions on the tag and if you're terrible at remembering, put a reminder on your phone to water it. You'll be happy to have that little guy in your life.